I love flower season in my yard. We were lucky enough to purchase a home last year with a ton of mature flowering landscaping. Of course, we have added more flowers along with vegetable and herb gardens because I’ve never seen a plant sale I didn’t like! I often cut flowers for the house and when replacing faded flowers last week I decided to save the dried flowers to make homemade potpourri! Unfortunately the roses don’t seem to keep their scent when they are dried but they are beautiful to look at! For my potpourri mix I used dried roses, mint, oregano, and rosemary but you can use any combination you like. (See below for 4 of my favorite potpourri recipes.) You can also use dried citrus (here is a great tutorial for drying orange slices.) I let my flowers and herbs dry naturally but if you are in a rush simply bake at 200 degrees on a baking sheet for an hour or so to dry them. Once dry remove the leaves of the herbs and mix in a small bowl. If you want more scent or need to refresh your potpourri you can add a few drops of your favorite essential oil to a spray bottle and mist the mixture as needed. Do you have a homemade potpourri recipe I should try? Leave it for me in the comments, I love trying new combinations! It’s always fun to have houseguests visiting and most of us truly want our guests to enjoy their stay in our homes. Here are 10 ways to make guests feel welcome when they are visiting your home. Have you ever slept in your guest bed or used the shower in your guest bathroom? Spend a day in the life of your houseguest and you may discover the bed needs a foam topper or, as we recently found out, the hot and cold water faucets were switched! Putting yourself in your guest’s shoes helps you to make them comfortable as most people would be too polite to let you know otherwise. 2. Give them the Wifi Password! Set up a guest wifi network on your home’s internet and leave the name of the network and password in your guest room so houseguests can easily get online when they need to. Put together a simple welcome basket in your guest room with bottled water, some small snacks, breath mints, and a favorite magazine. The small touches go a long way! Be sure the guest bathroom has soap, extra toilet paper, and necessary toiletries for guests to use if they don’t have their own. I like to fill a mini mason jar with cotton swabs and cotton balls as well and add a fresh flower in a bud vase for decoration. A simple luggage rack can help guests unpack without setting their luggage on the floor or bed. Keep quality sheets on the bed and provide cushy towels for your guests to use. Be sure there is an extra blanket in case they are cold at night. Have a coffee station set up in the kitchen so guests can help themselves to coffee without having to dig through your cabinets and drawers. Simply set out mugs, spoons, creamer, and sugar for a one-stop shop. You may not eat in the morning but your guest may be famished. Have easy grab and go breakfast foods on hand such as fresh pastries and fruit that don’t take a lot of work but can be eaten at whatever time your guests are hungry. Supplying guests with things like an iPhone dock or alarm clock is a small touch that can be a huge convenience for your weary travelers. Consider giving them a key to the house as well if they will be staying a while and/or coming and going independently. I’m a huge proponent of keeping greenery and fresh flowers in my house (along with other small touches that add luxury) and that means the guest room always has a fresh bouquet when visitors arrive. It doesn’t have to be fancy, a few blooms or branches from the yard can go a long way. It’s a small touch that makes a big difference! Do you have any additional tips to make guests feel welcome? Leave them in comments! Our family LOVES to go on cruises-it’s our go-to option for family vacations. I’m a beach girl at heart and nothing is so fun and relaxing to me than cruising away to the tropics with those I love the most! It’s affordable and offers fun options for everyone in the family. If you have small kids there are some important things to consider when cruising however. Here are amy top 10 tips for cruising with young children. We went on our first cruise six years ago just after my husband returned from his a year-long deployment. Our boys were 5, 2 (he turned 3 on the cruise!) and our youngest was just ten months. We wanted a nice relaxing vacation that we could enjoy with our children and thought a cruise would be our best, most cost efficient option. We did a lot of research and eventually decided on Carnival Cruise Line. Carnival is very family-oriented which we loved and had great kid’s “camp” options for our boys. Disney is another big family cruise line option but our boys are also not huge Disney fans so that area of appeal was not a big attraction for us and the price was overall higher-if you have huge Disney fans in your household it might be worth the extra cost! As I mentioned, part of our reason for choosing to cruise is the included childcare. If you plan on taking advantage of this perk be sure to research the childcare rules of the cruise line you choose. We researched Disney cruises before choosing Carnival but they had hourly childcare fees for children 3 and under which was a big downside for us. Carnival will take children who are not potty trained in their child care while some other cruise lines will not-be sure to know beforehand! Also, on Carnival the childcare is not open the first day/evening of the cruise until after 10pm (and you pay hourly after 10pm) so it’s good to know that so you can plan family options for that evening-we love catching the “dive in” movies by the pool with popcorn and calling it an early night so we can be well rested for the first full day of vacation! On our first cruise when our son was too young for “camp” we knew that we’d be spending quiet time in our room at night after the kids went to bed. Because it’s no fun to sit in a tiny room in the dark whispering so they don’t wake up, we chose a balcony room for that trip. We were able to put the kids to bed then enjoy ourselves out on the balcony in the evenings. Fast forward to our subsequent cruises and ever increasing mischievous and rambunctious boys and the thought of them in a balcony room gives me heart palpitations! Now we always choose oceanview rooms-the window helps us keep on a proper day/night schedule and gives lots of great views without the worry about a kid going overboard! On our past three cruises, we were also very excited to get one of their Deluxe Oceanview rooms that had two bunk beds along with a couch that turned into a bed and a king bed and more storage than a standard room-it was perfect for our family of five. It also had two bathrooms-one with a toilet, sink and shower and one with a small tub and sink which was immensely helpful with getting everyone bathroom time in the morning and evenings! Now that our children are getting a little older (11, 9, and 6) we are trying out adjoining rooms to give everyone a little more space. Research the ports you’ll be visiting ahead of time. 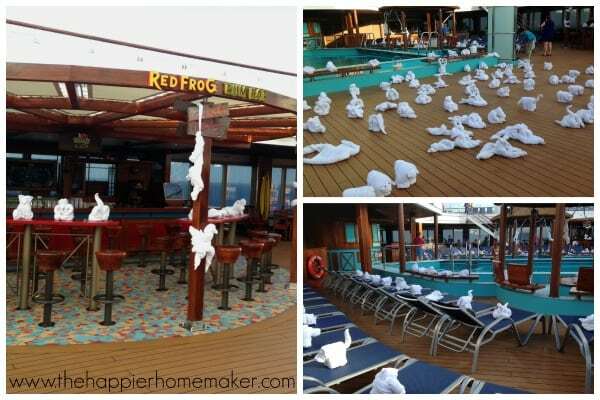 We neglected to do this with our first cruise to the Bahamas and ended up wandering around aimlessly at both of our ports and not really maximizing our time in port. Now we use resources like Cruise Critic to see the “musts” of each port as well as how accessible various attractions are from the cruise terminal. Our boarding passes always advise arriving at the cruise terminal at 12:30 for our cruises. Usually, the ship pulls out at 4pm and everyone must be on board by 3:30. We learned early on that arriving right at 12:30 was a recipe for disaster. 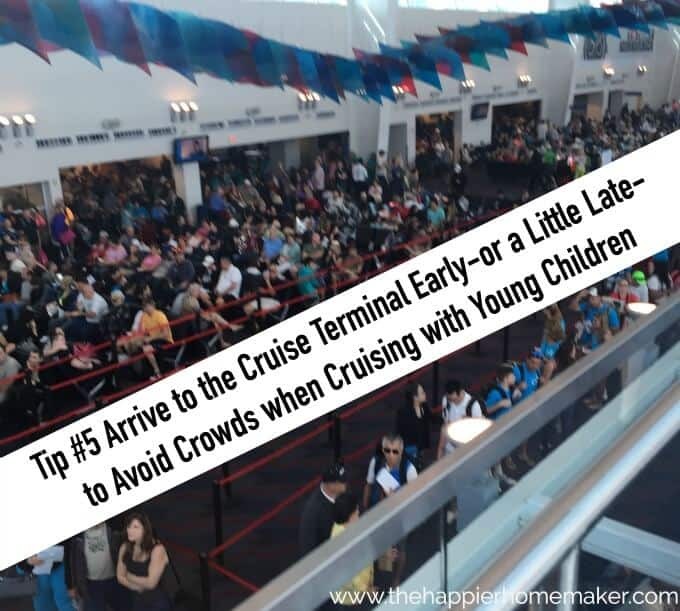 Cruise terminals get very crowded at that time, usually with standing room only crowds…not so fun with little ones! On our past two cruises we have chosen to arrive early-around 10:30am. We know that we will have to wait a while to board but arriving early lets us avoid waiting in long lines to check in and ensures there are seats available to sit in. I make sure to have money for the vending machines and fully charged Kindles for my kids to amuse themselves quietly during that time. If you can’t arrive early, try arriving a little later-around 1:30 or 2. We’ve taken this approach too and have walked right onto the ship as well without the waits. The only drawback to this method is less time to enjoy the ship before the crowds! *On Carnival if you can get the Faster to the Fun option that lets you board priority, it’s totally worth it!! 6. Choose Excursions Carefully-or Not at All! Some ports are great for doing excursions as a family-we in particular loved swimming with dolphins in Tortola with our oldest son and taking the entire family to the sea turtle farm in Grand Cayman. Make sure to pay attention to the length of time of various excursions and weigh carefully the ability of young children to be “on” that amount of time and time in the sun, etc. 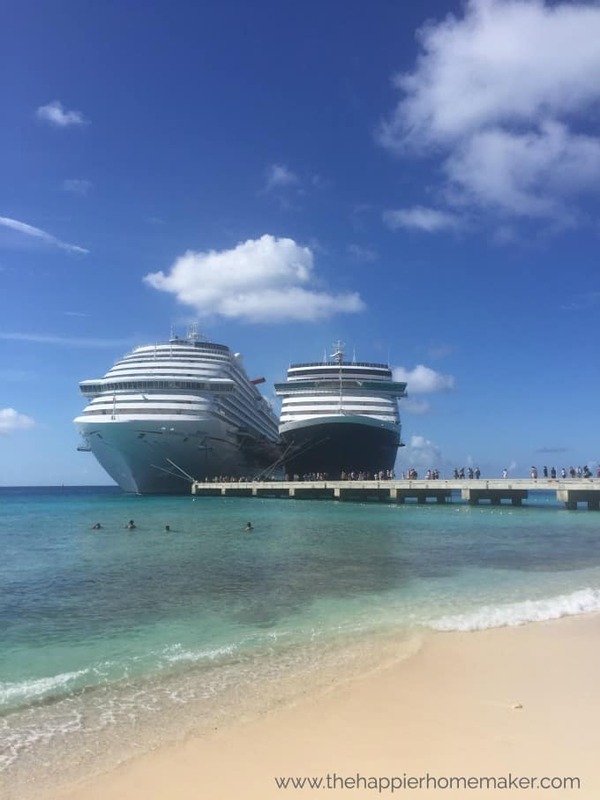 One of our favorite family activities to do on in port on a cruise is actually not an excursion at all-three of our cruises have passed through Grand Turk where a free public beach lies at the end of the dock-it’s less than ten minutes off the ship and costs nothing! In fact on our last cruise we took the kids out to play and snorkel, went back on the ship for lunch and a rest, then came back out in the afternoon. It didn’t cost us a dime to snorkel and build sandcastles and it was the kid’s favorite stop on the trip! My husband and I learned this lesson the hard way. We were so excited when our youngest was finally old enough to go to camp that we overdid it on “grownup time” and it led to a cruise full of tantrums and meltdowns. I’ve seen it happening over and over again with other families on every cruise we go on-crying children and frustrated parents who just wanted some alone time. It doesn’t make for a happy vacation for anyone! We learned our lesson and have found a great balance that keeps everyone happy on our past few cruises. We try to balance a few hours in the morning of camp time with an afternoon for family time then the kids head back to camp for kid’s dinner and fun afterwards until bedtime. It’s the best of both worlds-the kids don’t get burned out and I get some nice alone/relaxation time with my husband. I’m not apposed to using full up psychological warfare when it comes to getting my kids amped up for camp. I never tell them they “have” to go-I do my best to get them to where they want to go on their own. Even my four year old will get excited when I read him the camp schedule and tell him how lucky he is to get to do the fun activities and how much I wish I was allowed to go too. I’m also not opposed to bribery once and a while-a promised trip to the arcade or ice cream cone after being picked up from camp has worked magic many times! There are certain features I look for when choosing a ship to sail on-they are not all created equal! One of the biggest things I look for because I started cruising when I had younger children are splash pad areas. Every cruise line I have known has policies forbidding children from using pools unless they are potty trained-even with swim diapers! While I’ve heard that they aren’t supposed to use waterparks either I’ve never seen a little one turned away from the splash pad areas. It’s also a lot easier and less stressful to watch young kids play in a waterpark area than in a crowded pool! Another not so well known secret on cruise ships are the libraries if they have them. Every library I’ve found on Carnival ship has been stocked with board games even the youngest kids can enjoy-it’s never crowded and a good quiet place to have some downtime together. Again, do your research ahead of time-choose your ship based on the amenities that will work best for your family! I used to be a stickler about schedules and junk food even on vacation but eventually, I learned it’s best to relax a little on our cruises. Ice cream every day? Why not! Late bedtimes? Of course! Bending the rules helps my boys feel like they’re on vacation and gives incentives for good behavior on the trip. Just be careful to balance junk food with real meals to prevent upset tummies and late bedtimes with quiet time in the day so you don’t get meltdowns! Have you been on a cruise before? 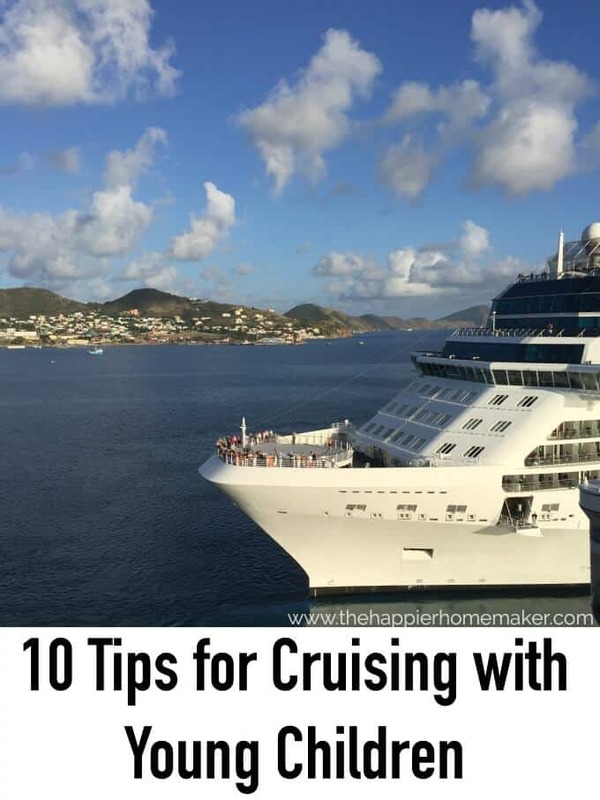 What tips for cruising with young children can you add to my list? There’s nothing like entertaining outside for a fun, casual get together but it can come with some challenges. Luckily with a few strategies and tips you can host outdoor parties like a pro. Here are my top 25 tips for outdoor entertaining. Think Disposable Table Coverings-Brown craft paper or dollar store tablecloths can help contain spills and make cleanup a breeze. Think Comfort-Use throw pillows to make sure seating is comfortable. Comfy guests are happy guests! Add a Fire-a fire pit is always the highlight of any outdoor gathering! Create a Picnic Area-if seating is at a shortage simply spread some blankets or rugs on the ground for picnic-style dining! Signature Drink-Have one signature drink on hand instead of moving the entire bar outside. DIY the Lighting-tealights in mini mason jars can look remarkably chic! Have fun! Don’t forget to enjoy your own party! Infusing water is an easy way to help you stay hydrated and drink more water without adding extra calories to your diet. During the summer, when fresh blueberries are plentiful, I love to make this Blueberry Lime Infused water recipe most days. When preparing fruit infused water it’s important to wash the fruit well first-we don’t want any residues from the outside of the fruit getting in our water! You can drink the water right away or allow it to soak a few hours for more flavor. It can also be made with sparkling water if you prefer. Encourage yourself to drink more water with this refreshing Blueberry Lime Infused water recipe perfect for hot summer days! Combine all ingredients in a pitcher. Allow to soak or drink immediately. We’re big cruisers at our house but we actually never went on a cruise until 2012 when my husband had recently returned from a year-long deployment in Iraq. At the time our boys were 5, 3, and 10 months old. We wanted to try a cruise but neither of us had ever been on one. I did extensive research on different cruise lines and we eventually chose to sail on Carnival. So many of our reason we chose Carnival were based on traveling with our children that I thought I would share the top 10 reasons we cruise on Carnival with kids. Kid’s Camp-Hello, free childcare! The kid’s camps are the number one reason we cruise on family vacations. As much as I love my littles, a few hours break is essential to our vacation time. Our kids LOVE the kid’s camps on Carnival and we love that they love them too! It gives my husband and myself some grown-up time and the kids some much-needed fun while on board. Carnival has supervised kid’s camps for ages 2-11 and organized activities for the older crowds as well. Seuss at Sea-the Seuss at Sea program is a little newer but offers fun Dr. Deuss themed activities throughout the cruise, including a green eggs and ham brunch! It’s especially fun if you have younger children. 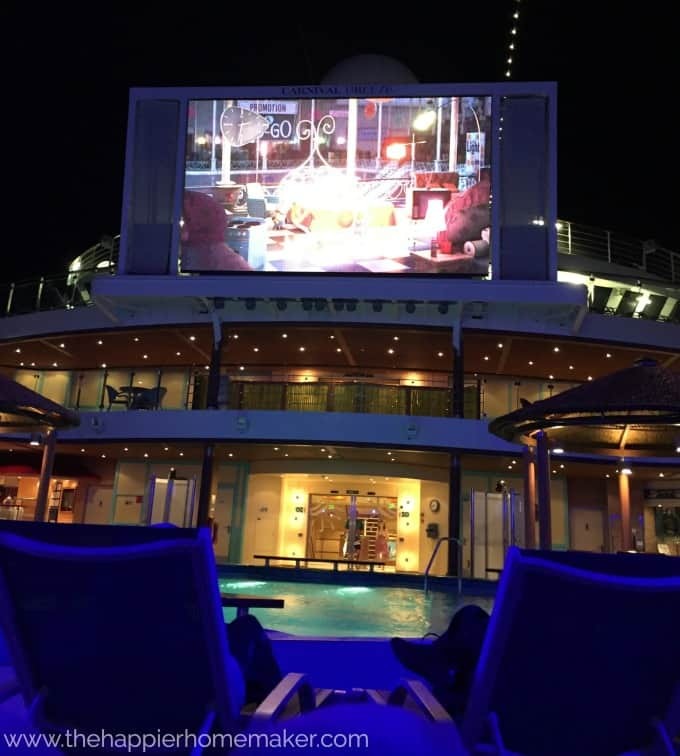 Dive in Movies-We love to close up the nights on board with the Dive-In Movies. Our boys get their fill of popcorn and watch some of our favorite movies under the stars at the giant over the pool movie screen. So much fun! Diaper Duty-When I was researching kid’s programs for our first cruise I had an infant and a potty-training toddler. Carnival was the only cruise line I could find that didn’t charge extra for camp for diapered children. They have children’s programming for kids 2 and up included in the price and camp staff change diapers for the little ones at no extra charge. Knowing we were in baby/toddler phase for years to come it was a huge factor in our choosing Carnival to cruise with kids. Sky Course-I hate heights but my daredevil little boys love the Sky Course. It’s an elevated rope course on the top deck of many of the refurbished and newer Carnival ships and keeps my boys busy on sea days! Sports Square-Also on the top deck of many ships is the Sports Square. Here the family stays busy playing basketball, running the track, playing corn hole or just hanging out. On sea days they also have a bar and hot dog stand. It’s a fun area of the ship to hang out with the kiddos. Arcade-The arcade is the highlight of my kid’s trip on a Carnival ship. We usually only take them once a cruise but they love it! We don’t allow our kids to make charges on their Sign and Sail cards but if you wanted to you could allow them to charge at the arcade themselves. Our kids would probably spend their college funds playing video games so for now at least, we use our cards when they play at the arcade. Ice Cream Machines-who doesn’t love ice cream? Carnival has self-serve ice cream and frozen yogurt machines on all of their Lido decks. It’s so much fun to grab a quick cone anytime you want-24/7! Camp Ocean! Camp Ocean is so great I had to list it twice. I already shared with you about how much the kids love it and the diaper duty but it would be wrong of me not to tell you how wonderful the staff is. They keep the kids organized and entertained. My boys always have a ball with them. We’ve even run into the same staff members on different ships and they’ve remembered our kids and their names-how amazing is that? Overall we absolutely love cruising with our kids. 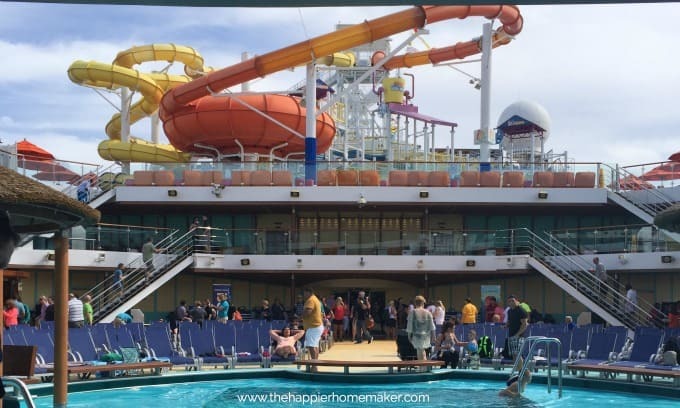 It’s hands down the most affordable and all-around relaxing way to take a family vacation for us, and Carnival makes it a fun time for the entire family! I’m a huge fan of quickbreads at my house. I almost always have banana bread on the counter for a quick slice for breakfast or zucchini muffins to pack in school lunches. Recently I combined three of my favorite quick bread recipes into one to make this delicious Chocolate Chip Zucchini Banana Bread that is going to be your new favorite! This recipe is rich and sweet enough to be called a dessert but packed with all the nutritional goodness of the banana and zucchini. My kids had no idea there were veggies in this bread which I absolutely love. They were begging for another batch almost immediately. Luckily it’s fast and easy to make as well! Rich chocolate chip bread with a secret dose of fruits and veggies inside! This Chocolate Chip Zucchini Banana bread will be your new favorite quick bread recipe! Preheat oven to 350 degrees. Spray a bread pan with nonstick spray. In a large bowl combine banana, zucchini, eggs, applesauce, and vanilla. Stir well until combined. Add all remaining ingredients other than chocolate chips and stir until just blended. Fold in 1 cup of chocolate chips. Pour batter into prepared pan. Top with remaining chocolate chips. Bake 55 minutes or until toothpick inserted in the middle comes out clean. Reduce cooking time for mini loaves or muffins. Summertime just begs for fruity, refreshing cocktails and this Orange Mojito recipe fits the bill perfectly. Building off the original Cuban Mojito cocktail, this version combines juicy orange with mint and a zing of lime for a drink you’ll want to enjoy all summer long! This Orange Mojito recipe has been moved to our main site. One of the first things I do when having people over to my home is start the diffuser. Nothing makes your home seem more inviting than a delicious smell when you walk through the door. Here are 5 must-try essential oil diffuser recipes to try when entertaining. Simply add these oil combinations to your favorite diffuser to instantly freshen up your home the next time you have guests! We have moved this recipe cocktail to our main blog here. Passionate about all things beautiful and chic, I created this website to be your one stop source of inspiration. Whether looking for exquisitely simple recipes, decorating inspiration, travel ideas, or ways to celebrate the everyday beauty of life; you've found your place.